These four essential items are useful for everything from sweeping dust from lenses, removing residue stains and picking up small bits of debris from hard-to reach lens surfaces. The Nikon static wisk™: A small brush that allows the user to sweep dust and other fine particles from lenses quickly and easily. 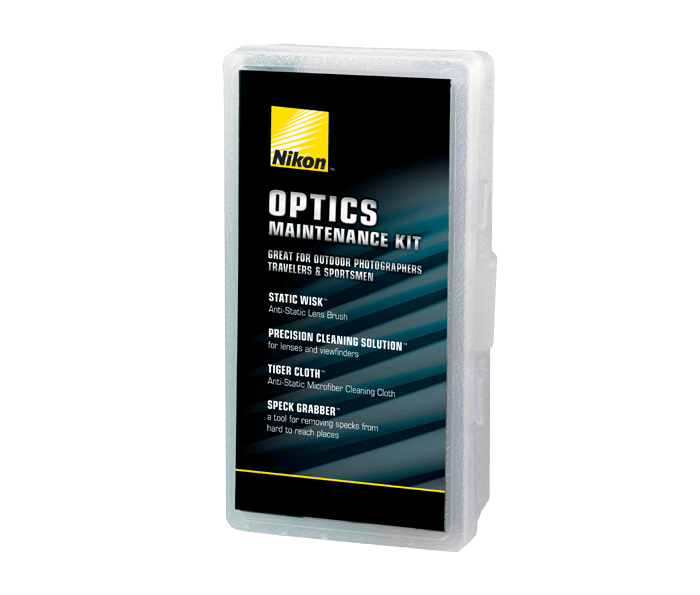 Nikon precision cleaning solution™: Can be applied to lenses to remove the residue from water droplets or similar lens-degrading stains or marks. Tiger Cloth™: Anti-static microfiber cleaning cloth that complements the Static Wisk and allows users to remove more stubborn particulate matter that may degrade image quality. Speck Grabber™: A long, slender tool with a pliable, tacky grabbing surface that is designed to allow the user to pick small bits of dirt or debris from hard-to-reach positions on the lens surface.